Any of us who have been climbing long enough realizes that the gear involves a significant amount of design, testing, and reshaping. As a result, none of it comes cheaply. Rock shoes, approach shoes, summer alpine boots, winter ice boots—soon your climbing closet will be full of more expensive footwear than Gisele's. And among all the gear in the climbing money pit, boots are the precious metals of the climbing mine. But—at the risk of continuing the mining analogy too long—you don't come across a truly fruitful vein often, so when you do, you've got to dig it. I have definitely been digging the Mammut Nordwands. Since the autumn alpine season in the cool and wet altitudes of the North Cascades and now into chilly early-winter Northeastern ice climbs on The Black Dike and mixed routes like Confusionism in Smugglers Notch, I feel like I've struck gold. There is perhaps a holy trinity in the ice climbing kit: boots, crampons, and tools. With each of this trinity, a climber forms a special and intimate relationship, learning it's strengths and weaknesses, when it might cause some trouble, when it will shine through. And with any part of this trinity, when you find the right one you definitely want to let your feelings be known. Without mentioning names, let's just say I've had my fair share of climbing boot relationships in the past. I've played the field. I've lived, I've learned. 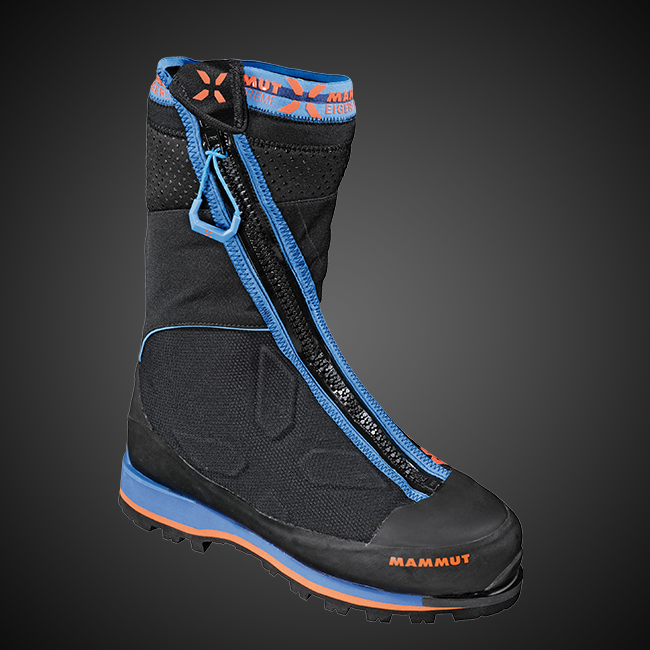 And with the Mammut Nordwand I've finally found a boot that I can commit to across the alpine and ice realms. I first checked out the Nordwands while passing by the Mammut store on a rainy day while climbing in Chamonix. I wasn't necessarily looking to leave my old boots behind. They'd been good to me. We did some cool things together. Things were OK. But in the back of my mind, I did wonder, “What else might be out there?” I found out the answer the moment my foot slipped into the Nordwand. Due to some foot surgery that was due to some nerve damage that was due to way too much pounding on my feet, I tend to desire a high-volume toe-box. Sometimes though, the translation of “high-volume toe box” seems to mean a sloppy fit. Not so with the Nordwands. The footbed has a narrow heel profile that locks in snugly, aided by the Nordwands Speed Lace system coupled with the velcro PowerStrap. Add to it the fact that my feet have the heat retention capacity of a Mexican-hairless Chihuahua. I read up on the boot's spec sheet and the Thinsulate 200B insulation and double-insulated carbon insole certainly caught my eye. After that first fling in France I thought about it awhile—I wasn't ready yet to commit...but I'd seen what was possible. By the time September rolled around, my mind was made up and it was high time to cut loose the anchor of my old boots and head for a new shore: I was heading to the North Cascades for some technical climbing in the colder altitude zones and with the typically “challenging” mid-September forecast shaping up, I knew I needed a blend of performance and warmth. When the boots arrived my doorstep, my first reaction was that they'd forgotten to send me a pair—the box was so light I thought something must've been missing. But, indeed, the only thing missing was the weight; with the carbon sole they come in at a featherweight 2.1 ounces per boot (US 9.5). I was out in the North Cascades for the AMGA Alpine Guide Exam (you can find out about that adventure on the Mammut Athlete blog). Since that was a pretty high-consequence event, I didn't want to find myself suddenly wishing for my old boots, so I brought them along—you know how hard breaking up can be. My old boots never left the car. I headed out from the trailhead with the Nordwands first to climb Mt. Shuksan and then to climb Sahale Peak. On Shuksan we climbed the Fisher Chimney Route, a series of 4-5th class gully sections of rock to the base camp, followed by Shuksan's Northeast Ridge, a smorgasbord of glacial travel, moderate ice, and rock up to 5.7. All of this in an unstable weather forecast. We left the trailhead in a drizzle and plodded through puddles and streams along the way. It was tough to be sure, but all along the way, the Nordwand was there for me, with its full integral gaiter and beefy YKK watertight zipper keeping my feet oblivious to the wet world around them. I rolled into the camp at Winnie's Slide warm and dry. But the next day, simply keeping me warm and dry wasn't going to be enough. I needed more out of the relationship: We planned to circumnavigate the summit pyramid, crossing over three different glaciers in the process, with steep snow and rock interfaces at each one, and then tackle the Northeast Ridge, with climbing up to 5.7. Keeping me warm and dry was nice, but I also was going to need a boot that could perform. The route began with low-angle ice followed by some steep snow. The flexible ankle cuff allowed for maximal crampon contact when doing French technique. That was followed by a lot of trudging, as we headed across the Sulphide Glacier and onto the Crystal Glacier, where the Northeast Ridge begins. The Nordwand had padding in all the right places, keeping things comfy as we chipped away at our circumnavigation. Things were a bit chossy as we got onto the Northeast Ridge, so I was really happy to have a low profile and light boot that allowed for maximal precision with foot placements and a toothy lug sole for firm grip in the scree. We picked our way carefully along the ridge, until it abruptly ends in front of the final two pitches of steeper face climbing. That was when the edging performance pulled through, the Nordwand's stiff sole making even half-dollar edges feel like a million bucks. In no time we were enjoying Shuksan's summit. For a few months my Nordwands and I went our separate ways—it was autumn and I was in the Northeast. The warm breezes were blowing. There was rock to be climbed. I loved the Nordwand...but the timing just wasn't right. Flash-forward to the cold days of November and I was feeling alone—I needed my warm and loving partner. I wanted to see what we could create together in the ice dance of the winter world. 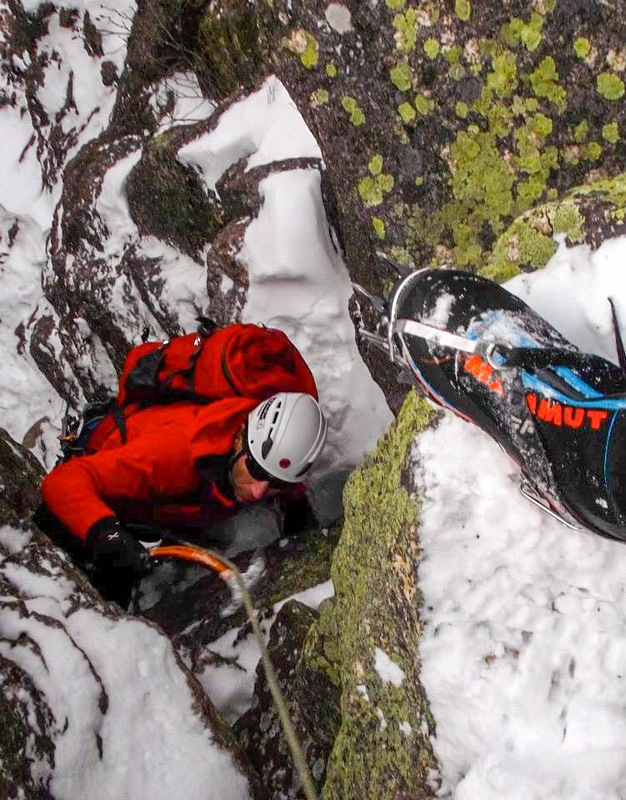 Our first winter fling was on The Black Dike, a mixed rock and ice New Hampshire multi-pitch classic. Though it was mid-November, you wouldn't have known it from the biting cold. I didn't know it either, happily ensconced in the Nordwand's Thinsulate. The welt on boot took tightly to my step-in ice 'pons so that my ice strikes were crisp and clean. Transitioning across some verglas onto the rock of the second pitch, the firm heel lock allowed me to squeeze maximal grab out of minimal purchase. Once on the rock, I was reminded again of the performance I'd experienced so many months ago on Shuksan's rocky Northeast Ridge, this time with crampons. Back onto thick ice and a blend of corners and columns for the third pitch, I enjoyed the snug fit provided by the Speed Lace system in combination with the flexibility of the upper cuff's PowerStrap. It was so good to be together again. 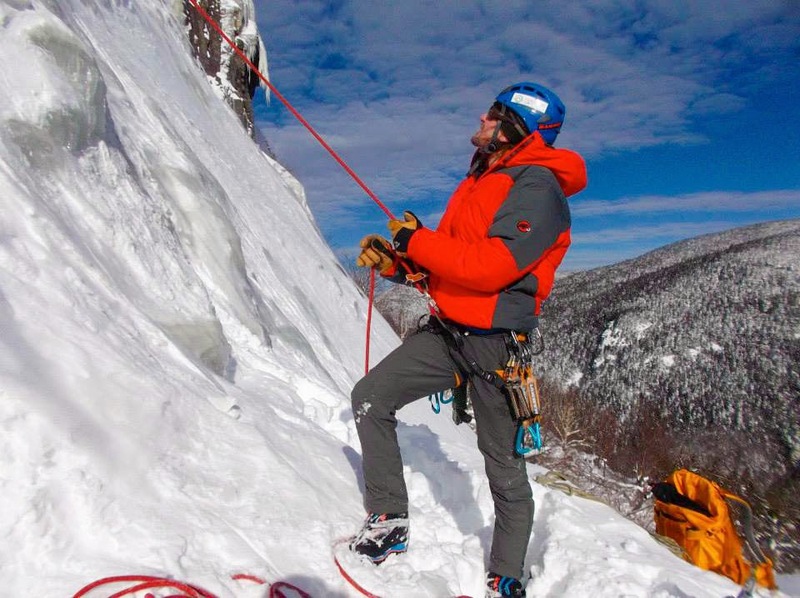 Since that cold day in November, the Nordwands and I have been everywhere together: mixed climbing on Smuggler's Notch's scratchy Ragnarock and the seldom-seen Confusionism, straight-up ice on Frankenstein's Standard Route, and alpine style action on Shoestring Gully. Finally, with the Nordwand, I've found a boot that spans the bridge between warmth and performance, suitable for summer alpine rock/glacier routes and winter ice. At last! There's a lot more on the horizon for the Nordwand and I. It's great to feel that while we know each other so well, there is still so much more to explore...together.